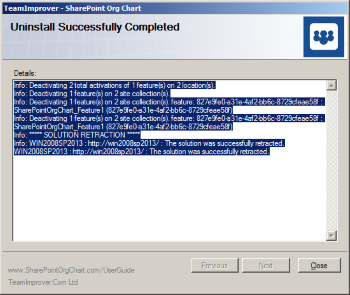 To remove the SharePointOrgChart simply run the setup.exe that is used to install the web part. 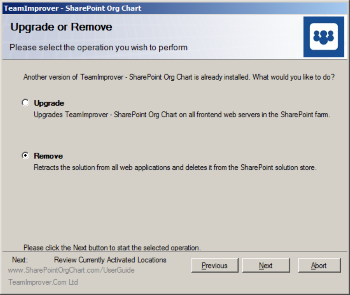 If you decide that the SharePointOrgChart is not a suitable for your organization then we would really appreciate some feedback as to how the product could be improved to meet your needs. 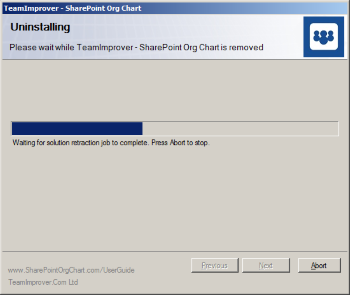 Start the setup program contained in the download package. You will need to have the correct administrative privileges to do this. 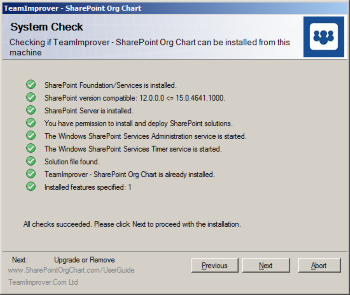 The Setup program will complete the appropriate system check. 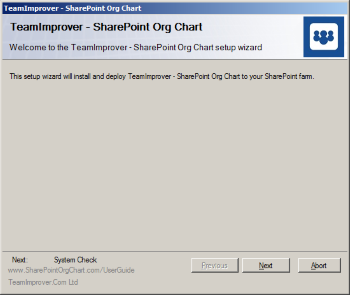 If the SharePointOrgChart has been deployed to your SharePoint farm and all the appropriate services are running you will be able to move to the next step. Pressing Next will begin the uninstall process. Once the web part has been removed a summary will be shown listing the site collections that have been updated.